Ireland’s preparations for its historic first Test Match provided a valuable opportunity for the squad to begin its transition from 50-over cricket to red-ball cricket, despite a frustrating climax to the match against Somerset County Cricket Club, which was abandoned without play due to inclement weather on the last day on the four-day match. After early morning rain in Taunton persisted through to the scheduled lunch break, match officials called the game off just after 1.30pm. • Tickets are selling quickly for the Test Match, fans can purchase their tickets online through Ticketmaster. • Work began today on turning the picturesque Malahide Cricket Club ground into a Test venue. The first infrastructure arrived this morning, with the build continuing through until early May. • Today also brought media reports that Pakistan’s 31-year old legspinner Yasir Shah, who was almost certain to feature, has withdrawn from his team’s tour of Ireland and England after picking up a stress fracture of his hip during the recent Pakistan Super League competition. 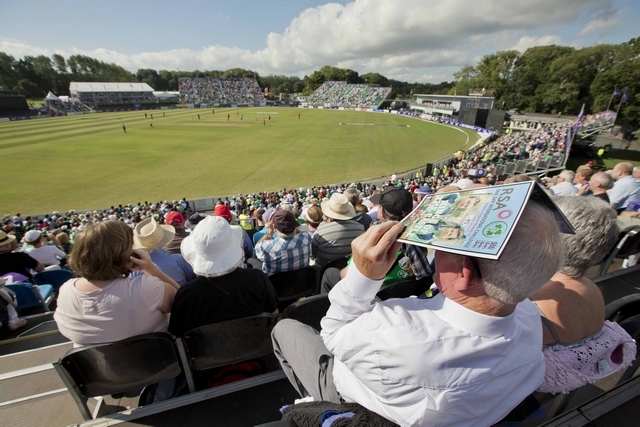 Image: Malahide in international match mode (Ireland v England, ODI, 2013). Image credit INPHO-Morgan Treacy.